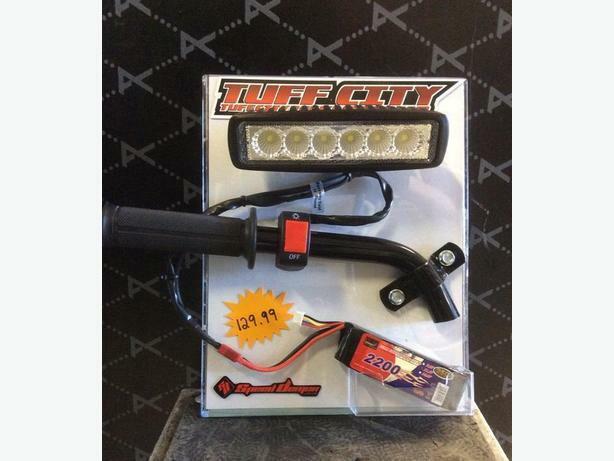  Log In needed $129 · LED Super bright Bike or ATV light kit complete. Check this out! Bright LED lights for any dirtbike = extend your riding time. Doesn't matter if you don't have battery, stator or an existing headlight, this solution works for any bike. We have complete light packages from $129.00 and they install quick with supplied brackets and switch. The lights are available in Flood or Spot depending on your needs. batteries are LiPo and last from 3-6 hours. Come by and check out our display in store! Tuff City Powersports, always a step ahead!